Paddle the beautiful protected waters of Pine Island Sound, Charlotte Harbor or Jug Creek River. Charts and route suggestions will be given or follow the markers for the brand new second phase of the Great Calusa Blueway Paddling Trail. Enjoy the wilderness of our mangrove encircled islands. Travel for miles with your only companions being the abundant wildlife of osprey, eagle, herons, egrets, pelicans (brown and white), roseate spoonbills, magnificent frigate birds and more. In the clear waters, fish are teeming and the occasional dolphin or manatee will join you. Rentals are available for half day or full day at Bokeelia on Pine Island. 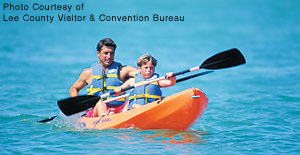 Kayaks may be rented to take with you to Cayo Costa, Cabbage Key, Upper Captiva or locally for 24 hour periods. The TROPIC STAR ferry can transport kayaks (yours or ours) to our scheduled island destinations. There is a $20.00 roundtrip transport charge to transport personal kayaks on the ferry. Consecutive day discounts are available at all locations. Discounts are at 5% 2 days, 10% 3 days, 15% 5 days and 20% 7 days. Rates quoted do not include marina parking. To reserve kayaks with rudders, add $10 per day to rental charges. Note rudder kayaks may not be available on your rental days.